I'd like to replace the decals on my rig but upon searching around online regularly I've seen nothing available. Seems if I want one now, I have to buy a camper underneath it. I want to keep the original logos in place, just not the current monstrosities that are glued on now. Has anyone ever taken a logo and reproduced it to match the original on their own? 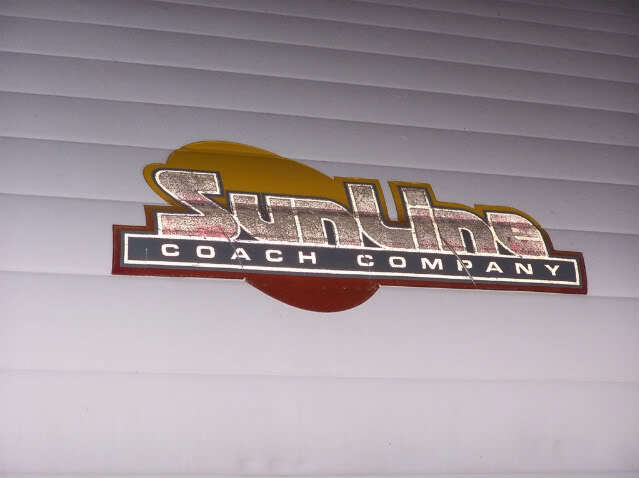 Any information on the company who printed logo's for Sunline? I'd think they would have all the specs of all the decals. Stoltzfus RV in Adamstown, PA has one of the big sun ones that goes on the front or back. (not sure) It's $40. I'm sure they'd ship it to you. Unfortunately they don't have the style I'm seeking... my 92 has the older logo that I'd like to duplicate... I'm going to talk to my cousin and see what he can do about scanning and reproducing the old logo to specs... something I think he could do minus the reflective backing. If it's too much time/effort/money, I'll go with 2 of the new logo replacements from Stotlzfus. When I spoke with the lady on the phone she did indicate to me that she had a bunch of the new front/back logos... $40/each with shipping seems steep but I guess the old no more supply with a demand = Lode pays. I snagged up two of the ones like Stolfutz (sp?) has- they're in good shape. I got one direct from them, and another from a board member. When the one I have in use is worn out, I plan to make stencils or use the other for a guide and get the logo airbrushed on- I'm sure paint'll last longer than decals of any type.